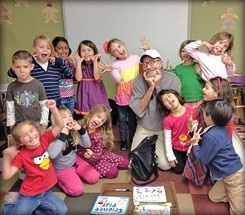 Last week I was invited to bring my artsy and written-word self to a local Montessori school. I’d donated several years of Kids Discover magazines to their library and was asked to make an appearance and share some of my drawings with the kids. After discussing the time and date on the phone with the principal, I hung up and immediately went to Google to uncover what a Montessori school actually is. For all I knew it was a French term for “underage welders,” and that perhaps I should educate myself a bit before being tossed into that particular academic foray. Upon visiting the quintessential though often-maligned (for good reason) Wikipedia page on Montessori, I learned that it was not necessarily a group of schools as much as a different approach to education, finding most of its methodologies and practices in much younger children. Assembled by Italian (hey, I was close) physician Maria Montessori in 1897, and culminating with her first classroom in Rome in 1907, it was to be an approach using mixed-age students (roughly 3-9 years old) that focused on observation and material discovery, rather than by instruction. Students are not given free range to explore any topic, as some may present certain problems (traffic patterns, skydiving, and anything to do with fire come to mind). Rather, they are presented with activities within a specified range. So, with the basics of this educational system safely tucked into my brain, I made the trip. This particular school was a kindergarten-based Montessori unit, so the kids were all roughly in the 3,4, & 5 year range. The first thing I noticed was the presence of a large black Labrador whose name was Big Ben. The principal explained that the dog served as a calming influence in the classroom, populated of course with fairly excitable small children. This “facility dog” also gave the kids certain responsibilities such as grooming, feeding, playing fetch, etc. Though pets in the school are not a hallmark of these types of education, Maria Montessori advocated the presence of living things (besides people) in many facets of learning. The kids were absolutely thrilled with the idea that a person could actually get paid to draw things. They were engaging, inquisitive, and terribly polite. Upon scanning the room I noticed that there were any number of activities that the kids could dive into, including word work, mathematics, the arts, the environment, even natural sciences. Needless to say, my hour of fame flew by and I was somewhat saddened that I had to go back to work (if you can label blogging and drawing cartoons as work). The kids promised to send me drawings of the things they had learned during my visit, and within a week I had received a fairly stuffed package in the mail, replete with doodles, observations, and drawings ranging from princesses to aliens (I always advocate the illustration of beings from another planet because no one can tell you if they are correct or not). These objets d’art (look it up) hold a high place of honor in my office because they come from the heart. And that’s important. Your classroom may not have the distinction, resources, or approved curriculum to be a full-fledged Montessori, but I highly suggest that you at least look into its founding principles. If you can take at least one thing from your investigation, then your time will have been well spent–and your students will thank you.